Create a mound of frosting on top of your cupcake. Cut a circle of black icing and attach to the frosting, smoothing the icing into a dome with your hands. 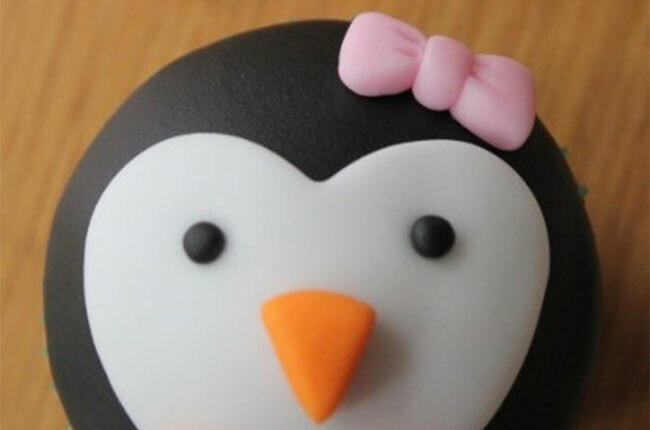 Use the heart cutter to cut out a heart of white icing for the penguin’s face and stick to the top of the cupcake with a little water. With orange icing, cut it to make it look like a beak. Use any tool to make small indentations for the eyes and then roll two small balls of black icing for the eyes as well. To make the feet, make two balls of orange icing into triangle shapes and use a blade to make two indentations for the feet. To make the bows use any color icing to make two tiny triangles and a ball. Join these together and use a tool to give it some shape and depth. To make the bobble hat, cut a circle of any colored icing. Add a strip of icing for the brim and use a tool to mark the rim of the hat. Attach a small ball of icing for the bobble and use the tool to give it texture. The finished cupcakes, how cute do they look!